This item ships free in the continental United States! CellarPro 4200VSi for interior applications designed to operate in extreme temperature conditions (+85°F). Dimensions 19.6"H×14.1"W×25.1"D and max 42 amps. CellarPro 4200VSx for exterior applications to operate in extreme temperature conditions (+115F) for through wall installation in an exterior wall. Exterior Package includes: weather hood, coated condenser coils, double powdercoated case, reusable aluminum filter, and exterior-grade power cord. Dimensions 19.7"H×14.5"W×27.6"D and max 42 amps. Up to 1500 cu ft capacity - cubic footage is calculate by measuring the room dimensions and multiplying H' x W' X D'. Our remote control kit allows the control panel to be installed in a remote location from the cooling unit. Connected via 10 feet of 18-gauge low voltage wiring, the control panel can be installed anywhere that's convenient for you, inside or outside the wine cellar. If you'd like more than 10 feet of wire, let us know when you checkout in the "special instructions" field. We charge $0.50 per foot after the first 10 feet. Perfect for cooling units that will be installed in remote or hard-to-reach locations, this kit allows the cooling unit to be controlled, and the temperature display to be viewed, remotely via the remote control panel. 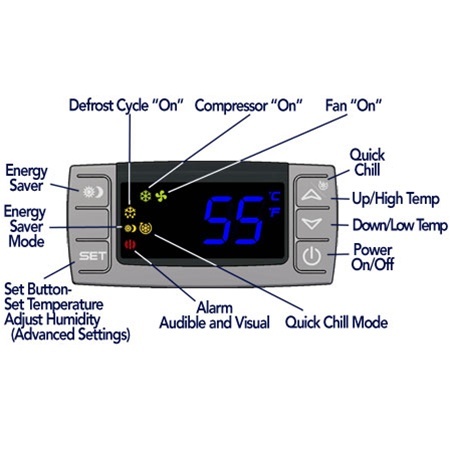 Please note: switches for features excluded from the control panel, such as the variable speed fans and the condensate evaporator, are not controlled by the remote control panel. Custom duct hood for CellarPro 3200 / 4200 VS and 3000S / 4000S Split Refrigeration Systems. With this kit, the cold air intake/exhaust can be ducted up to 100 equivalent feet (50 feet per opening). Duct openings are designed to attach to two 8-inch ducts for evaporator intake and exhaust. Custom design allows access to controls and switches on the face of the cooling unit. Requires 9 inches of additional height at the front of the cooling unit. Kit includes: Duct hood, 50 feet (2x25) of 8-inch insulated (R-6) ducting and bottle probe. We recommend the use of our remote control display kit together with our front duct kit. Please note: The high fan speed setting is recommended as the duct run increases in length. Custom duct hood for CellarPro 3200 and 4200 Series wine cooling units. With this kit, the hot air intake/exhaust can be ducted up to 100 equivalent feet (50 feet per opening). Duct openings are designed to attach to two 8" ducts for condenser intake and exhaust. Removable slot plate provides easy access to removable air filter. Kit includes: Duct hood and 50 feet (2x25) of 8-inch insulated (R-6) ducting. Custom duct hood and inline fan allow the hot air intake/exhaust to be ducted up to 200 equivalent feet (100 feet per opening). Duct openings are designed to attach to two 8" ducts for condenser intake and exhaust. Removable slot plate provides easy access to our air filter. Inline fan receives switched power from the cooling unit. Kit includes: Rear vent cover, 240 CFM 8-inch inline fan and 50 feet (2x25) of 8-inch insulated (R-6) ducting. Bottle probe temperature sensor allows our wine cooling units to cycle on/off based on changes in liquid temperature inside the wine cellar. 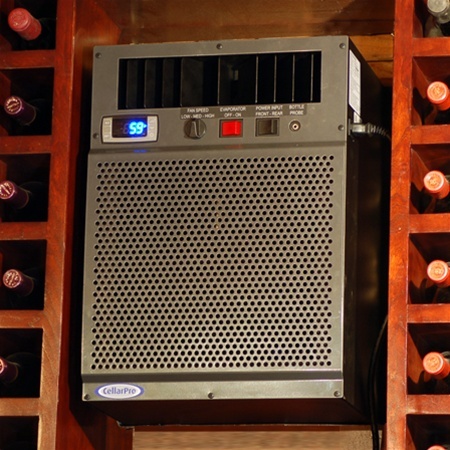 Bottle probes are recommended when the wine cooling unit will be placed remotely (ie the cold air will be ducted), and/or it cannot be placed near the top of the wine cellar. The bottle probe also can be used in odd-shaped wine cellars to control the cooling unit based on temperatures "around the corner". Our bottle probe, which includes a rubber bottle stopper to avoid leaks and spills, can be inserted into a wine bottle filled with water and alcohol to avoid bacteria growth. The 10-foot cord allows the bottle to be placed almost anywhere inside the wine cellar. The other side of the probe is fitted with a jack that plugs directly into the face of the wine cooling unit. When using a bottle probe, we recommend reducing the temperature (HY) differential from 4 degrees to 1 degree. Refer to our Owners Manual for further instructions. Compatible with all CellarPro wine cooling units. PLEASE NOTE: CellarPro 1800 Series cooling units must be configured in the factory to accommodate the use of a bottle probe. Our self-regulating compressor heater attaches to the compressor and provides reliable peak heating during critical cold periods. Once the compressor starts up and/or temperatures start to rise, the compressor heater reduces its heating. 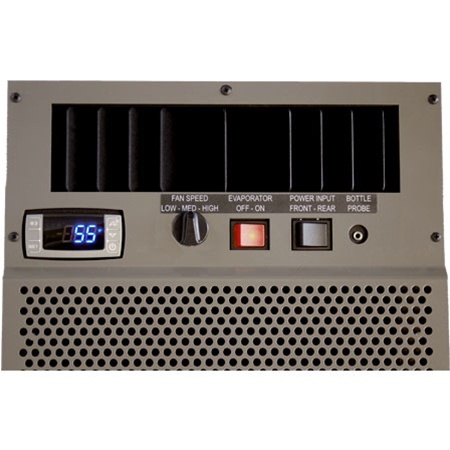 The compressor heater is required when the condenser (rear) side of CellarPro cooling units will be exposed to temperatures below 40°F. When the cooling unit is exposed to cold temperatures, the refrigerant in the compressor can migrate into the crankcase oil when the compressor is not running. On startup, this can cause excessive motor wear and a loss of refrigeration efficiency. The compressor heater protects the compressor from damage in cold conditions below 40°F. 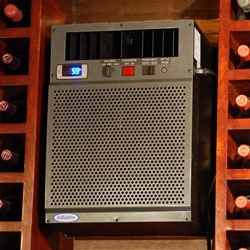 Reusable aluminum air filter fits all CellarPro 3200 and 4200 wine cooling units and is designed for interior or exterior use. Multiple layers of expanded, corrugated aluminum sheets are stacked in staggered directions to let dust and dirt deep into the filter. The filters are reusable, and can be cleaned with steam or hot water spray. Actual length and width are 3/8" less than the size shown. Filters meet UL Class 2 flame retardance requirements. Maximum temperature is 240 degrees. These aluminum filters fit all CellarPro 3200 and 4200 wine cooling units, and are designed for interior or exterior use.